Scouts must be 13 years old. They must be a First Class Scout and have completed Introduction to Leadership Skills for Troops. 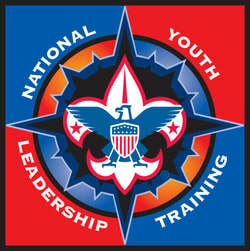 Venturers must fall within the maximum age allowance for their program. They must have completed Introduction to Leadership Skills for Crews. It is recommended that they have had at least one year of camping experience. While NYLT is not an outdoor skills course, it is important that each participant have basic camping and outdoor cooking experience. August 11, 11:00am-12:00pm - Come in uniform!